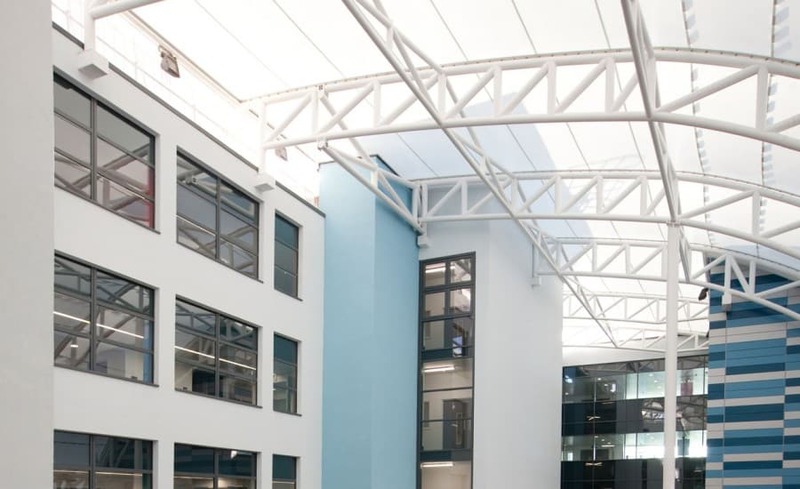 Working as a subcontractor to Skanska, Architen Landrell was contracted to install a tensile fabric roof canopy to cover a central street between the old and new school buildings. 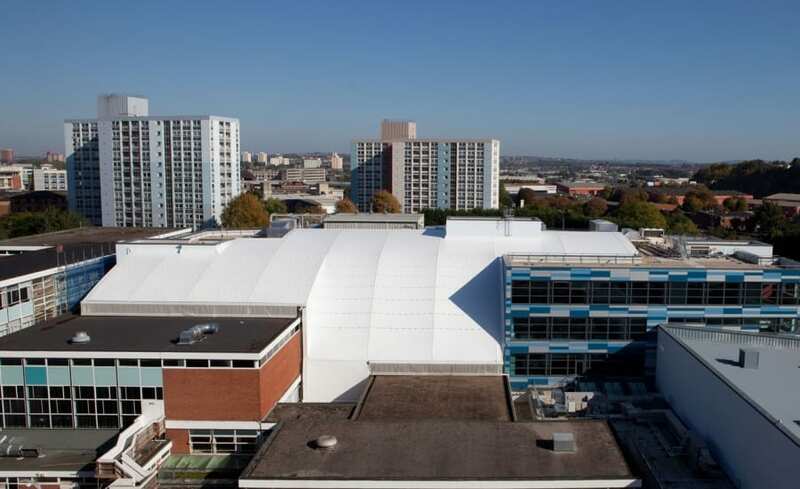 St Mary Redcliffe School was one of six school projects awarded to Skanska in the Bristol area and the only one featuring a tensile fabric roof. As local suppliers with an existing relationship with Skanska, Architen Landrell was taken on board to design, manufacture and install of a 900sqm tensile fabric roof made up of a series of 9 barrel vaults and 1 wall panel. As an inner city site, designers were keen to incorporate an all-weather space where pupils could spend recreational as well as educational time. As a result, the project brief was developed for a tensile fabric roof to weatherproof a street area between the existing school buildings and a new purpose built block. 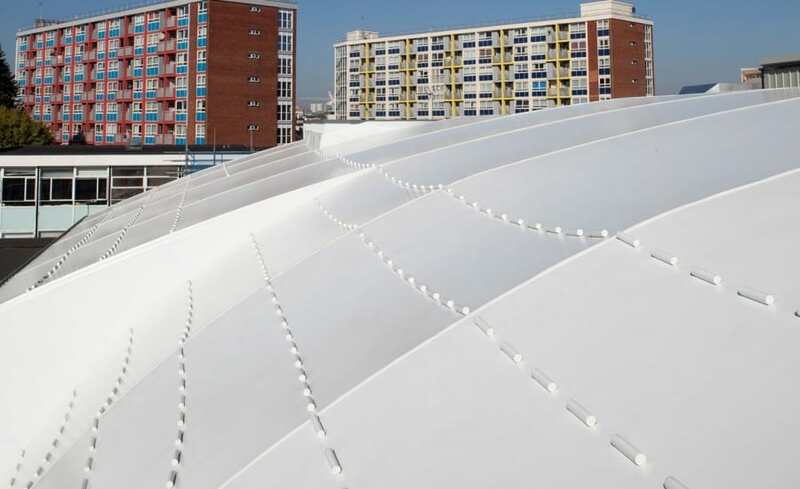 After tough competition and negotiations, Architen Landrell was contracted to design, manufacture and install the tensile fabric roof canopy, supporting steelwork, gutter system, drainage pipework, aluminium flashings, rain mesh and snow barriers. A bright white PVC coated polyester material was chosen to create the roof canopy for a number of reasons. As well as providing good value for money, the fabric offered flexibility, a good level of lighting transmission and a crisp, clean look against both the new and old buildings. The support structure consisted of nearly 100 tonnes of steel comprising of large truss sections and columns. As the existing buildings were too fragile for us to be able to fix to, the structure needed to be self supported. As a result, columns were designed into the scheme at one end and the remainder of the structure was supported by large wall brackets located around the perimeter. The structural steelwork is extremely complex and provides a striking contrast against the white fabric, making this functional element a stunning design feature. The snow guards were strategically positioned on the surface of the fabric and designed to prevent any build up of snow or ice avalanching onto the fragile existing buildings below. As the snow melts, due to the warmer temperatures below the fabric, the guards prevent it from slipping against the smooth surface of the fabric, allowing it to slowly disperse into the gutter system. During the installation period, access into the street area was extremely limited and careful coordination with other onsite operations had to be considered. Craneage could only be undertaken outside of school hours as the existing school remained live throughout the whole project. Our steel erection team rose to the challenge and completed the installation to a high standard and within the deadline. The project, which has seen the original 1960s building replaced by sleek classrooms and modern fixtures, has been a labour of love for head teacher Elisabeth Gilpin and her deputy Anne Vickers, who worked closely with the Architects and Skanska to see their vision become reality. 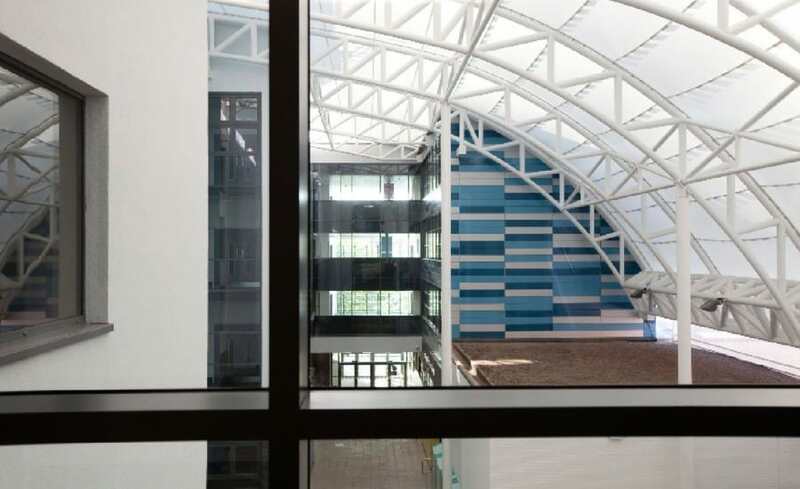 Elisabeth Gilpin reflects on the now completed school building – ” I love the central area between the old and new building with its high-tensile fabric roof. This light, airy four-storey space will give students extra covered space at lunch time and a covered route between classes and space for lockers. Project Manager Mark Jenkins comments It was a long road from Design to completion, which allowed Architen to form a close working relationship with Skanska and the Design Team. The Architen Landrell team is proud to have participated in this exciting transformation and everyone involved should be congratulated on their efforts.